Hi I’m Oscar! I hope you like all my pictures. 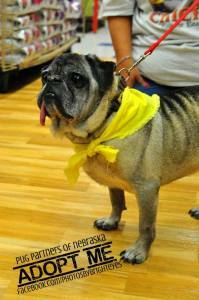 I am 9 years young and my foster mom thinks I’d be a great fit with a lot of homes! In my foster home there are two kids a girl who is 10 and a boy who is 7 and boy do I love them! When they start petting me I get excited and start rolling around and brushing up against them. I love being petted and belly rubs. Occasionally I like to sing or talk to you. My foster family is working with me so I can sing and talk at more appropriate times. 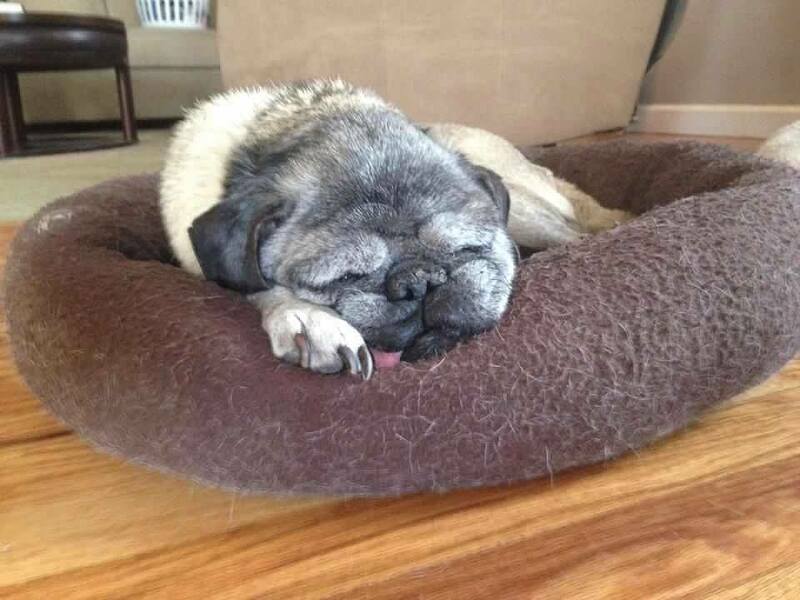 I have three other pugs in my foster home I like them but would be just fine in a home without as I don’t interact with them much. I like to sleep and cuddle a lot. When your feet are propped up I love to run underneath them. My tongue hangs out all the time so I eat well with soft food or small kibble. My foster family also thinks I don’t have the best hearing as I don’t respond to verbal cues; but do respond well with physical cues. Also I love walks and am great on a leash. Hopefully I’ll find my furever home soon so I can enjoy lots of walks with my furever family in the nice fall weather coming up. UPDATE: Oscar here…still looking for my forever home. While I’ve been waiting I have made my self pretty comfortable at my foster home. 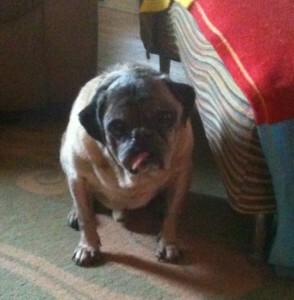 I live with three other young, rambunctious pugs and get along great with them. I mostly spend my days napping. Napping is my favorite. I will make a bed out of just about anything. I have two beds to choose from at my foster but have no problem using blankets left on the ground, laundry etc. If it’s on the ground it’s fair game to be a bed for me. I also enjoy roaming the back yard. I can ‘t see very well anymore but adapt to my surroundings really well. On a nice day I love to spend time sniffing out the yard then sun bathing. . My foster says I can be trusted with free reign of the house. I very rarely have accidents. I eat once a day and if you get me a treat, my foster mom finds it best to be a soft treat or a chip like treat-they are easier to chew for me. My nails seem to grow fast and definitely need to be trimmed at a maximum every six weeks. My foster mom suggests taking me to The Green Spot for that. I don’t really like my nails trimmed and they work with me very well. Speaking of grooming, I am blind and deaf, because of that my foster mom wouldn’t suggest taking me to a groomer. She suggests monthly baths at home. I do good in the water and good with a towel dry/blow drying. I am good with kids, but would be best with kids 7/8 and older. I really hope you enjoy my updated bio and pics. Please share and help me find my forever home!